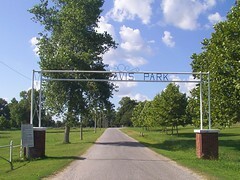 The Southerland Addition of Jeff Davis Park has been significant in the history of Rush Springs. The City purchased this property from the Southerland estate in 1988. The first business on this location was the Hudson Houston Lumber Company, established in the early 1920's. When sweet potatoes became a major cash crop in the late 1920's . This building was then used as a processing and shipping warehouse for the sweet potatoes. In the late 1930's the growing of watermelons for seed became a thriving enterprise.